Walk on! Shun Ning Road! A single mother who is also a victim of the issue of the right of abode in the Hong Kong ; a hawker from a Mainland-Hong Kong family who is also a senior neighbour in Shamshuipo; they are all low-income tenants in this urban renewal area. 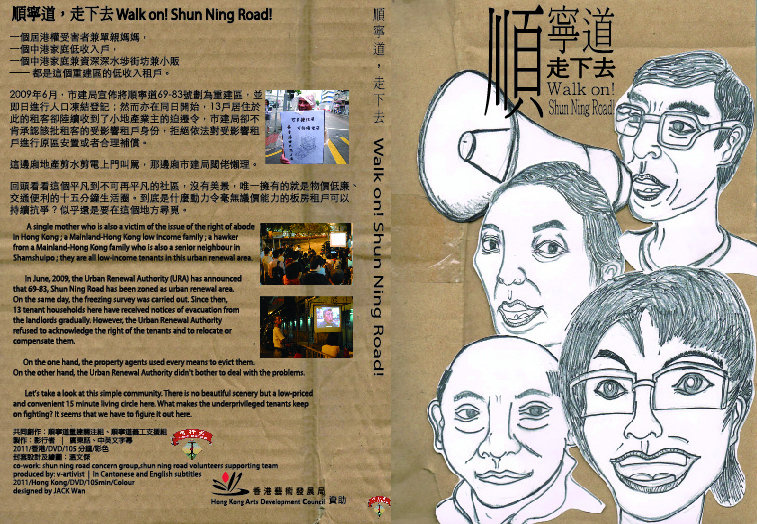 In June, 2009, the Urban Renewal Authority has announced that 69-83, Shun Ning Road has been zoned as urban renewal area. On the same day, the freezing survey was carried out. Since then, 13 tenant households here have received notices of evacuation from the landlords gradually. However, the Urban Renewal Authority refused to admit the identity of the tenants and to relocate them or compensate them reasonably. On the one hand, the property agents used every means to evict them. On the other hand, the Urban Renewal Authority didn’t bother to deal with the problems. Let’s take a look at this simple community. There is no beautiful scenery but a cheap and convenient 10 minute living cycle here. What makes the tenants keep on fighting? It seems that we have to figure it out here.